Saw most of this pageant but had to quit because of rain. Cousin Steve has played the part of Hiawatha for 12 years. Got home late that nite to find high winds had uprooted trees--torn branches--flattened crops. Have gotten in on a number of "Clan gatherings" and visited in Mpls also saw Twins beat Washington Senators. 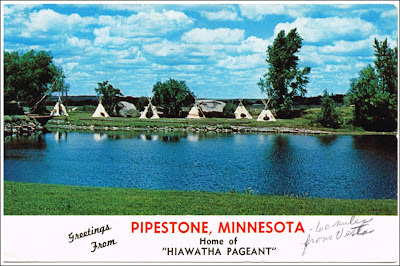 Smiths.DMarks also shares some lore about Hiawatha, Pipestone, Sioux Indians, and the word "how." Check it out. For more on Hiawatha, see Three Dubious Literary Classics and Theosophy Temple Has Hiawatha Paintings. Thanks for posting this. I did an earlier one about a Hiawatha pageant in Petoskey, Michigan, a hundred years ago. It featured several "Indians" with Plains headdresses. I assumed they were fake Indians, but apparently they were actually local Odawa. By the way, and off topic, you might want to check into the new TV show "Defiance" which stars Graham Greene.